Tech was the star of Super Bowl LIII — during the commercials, anyways. Super Bowl LIII may have been low on sports excitement, but it had plenty of robots and artificial intelligences — in the commercials, anyways. Ad after ad featured bots and AIs — mostly for laughs, but sometimes with ominous overtones about the future. Here’s our roundup. “I’m sorry, but you’re never going to be emotionally complex enough for that job,” the bot is told in the commercial. 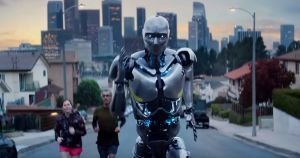 Michelob Ultra also aired an ad featuring robots unable to live out their dreams — in this instance, the dream being the ability to throw back a low-calorie beer after a run, spin class, or successful day at the driving range. Pringles went essentially the same route as Michelob Ultra, only this time a smart assistant was able to compute the number of potential Pringle flavor combinations but unable to enjoy the taste of a single chip. Bummer. Not all of the Super Bowl ads focused on the feelings of robots, though. SimpliSafe’s “Fear Is Everywhere” followed a human as he navigated a world in which, well, fear was everywhere. “In five years, robots will be able to do your job, your job, your job…” he overhears someone say at a baseball game, and later, a smart assistant ominously promises his wife that it’s “always” listening. A Sprint ad brought back the levity. In it, a trio of robots brainstorming ad ideas with a Sprint spokesperson and sports legend Bo Jackson were seemingly included for no reason other than laughs (and a mermaid, pegasus, and keytar also made appearances). Amazon also went for humor with its Alexa ad. This one featured the company’s failed attempts to integrate its smart assistant into various devices, including a dog collar that translates barks into Amazon orders. Cue dog owner Harrison Ford accepting a pallet’s worth of dog food.